Our first house that my husband and I lived in had a fireplace…seems silly in Arizona but it was really nice to have during our chillier months. Plus once we started having kiddlets, Santa obviously need a point of entry!!! The house we live in now is without a fireplace and we really didn’t think we’d miss it terribly until those same mini people started asking how Santa was gonna get in??!! So, last year I decided it’d be fun to build a faux fireplace. It served a few purposes…we used it for product display at a holiday boutique and then it made its way into my great room for the perfect spot to hang stockings all white giving St. Nick a place to sneak on in and deliver the presents. I found some basic plans that are SUPER easy to follow on Ana White. There is even a cut list if those dimensions work for you. I used the plans as a jumping off point but made adjustment on dimensions and style based on my personal needs. I start out most of my ideas by sketching out a design and fine-tuning the detail as I go. 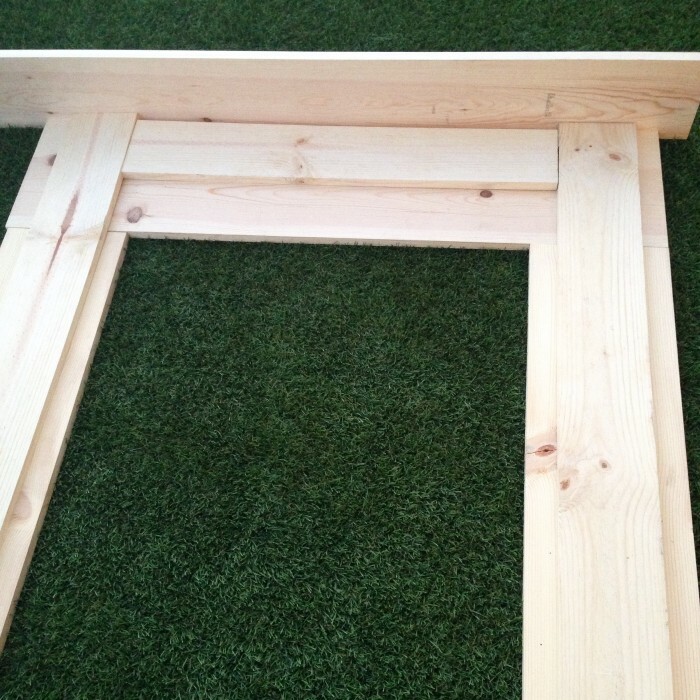 I had Home Depot make some of the cuts and the rest was done at home using my Ryobi compound miter saw. 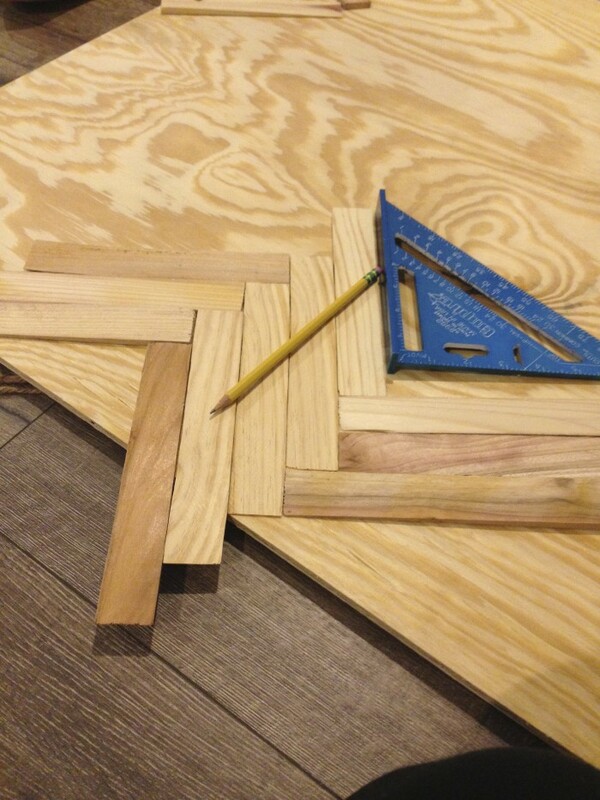 Once all of the pieces were cut, I placed all of it together to make sure it was measured out correctly. Once all of the pieces fit, I started to assemble it using wood glue and a nail gun. 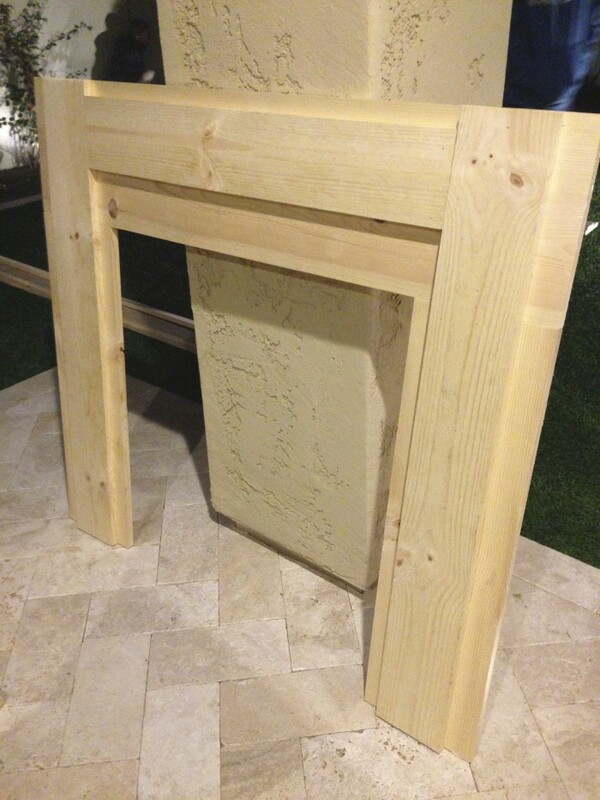 Once the main structure was assembled…I secured the entire thing to a board for the hearth and stability. 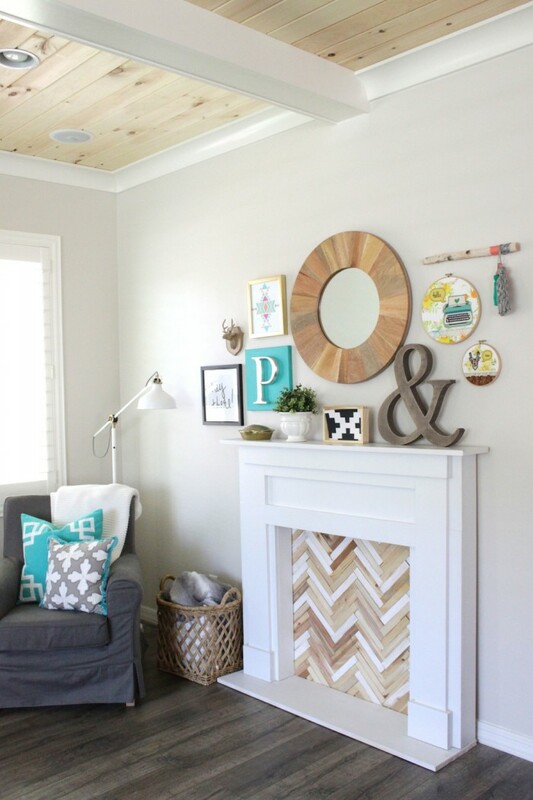 Once fully assembled, I sanded, primed and painted the faux mantel. 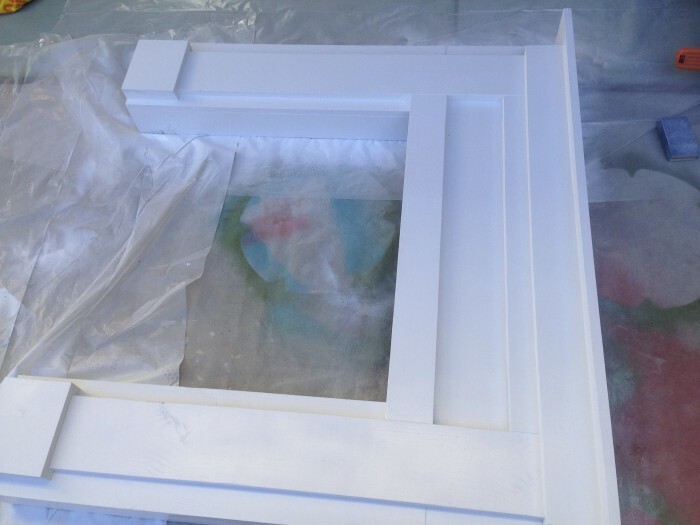 I used spray paint…I was in a hurry to get it completed for our boutique and using an oil based paint dries to a harder finish. 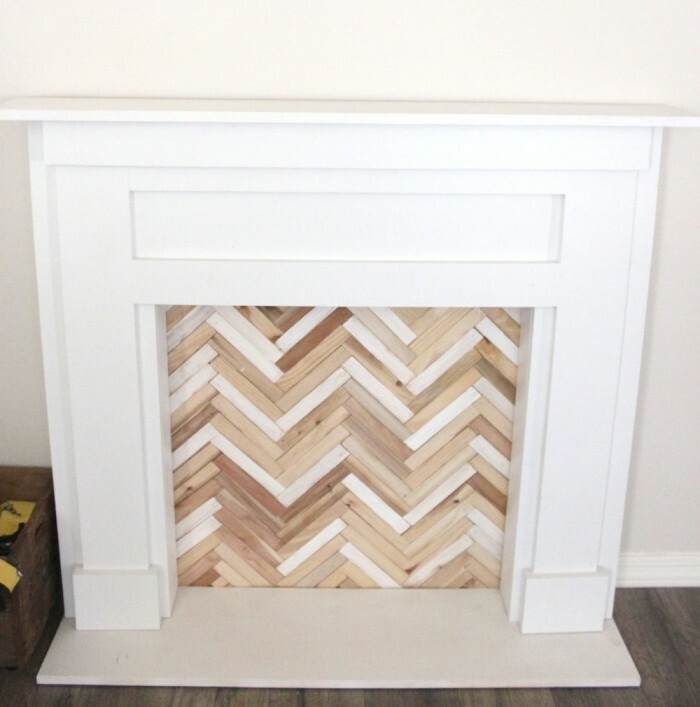 So that the wall wasn’t showing thru, I decided to build a herringbone firebox using wooden door shims. 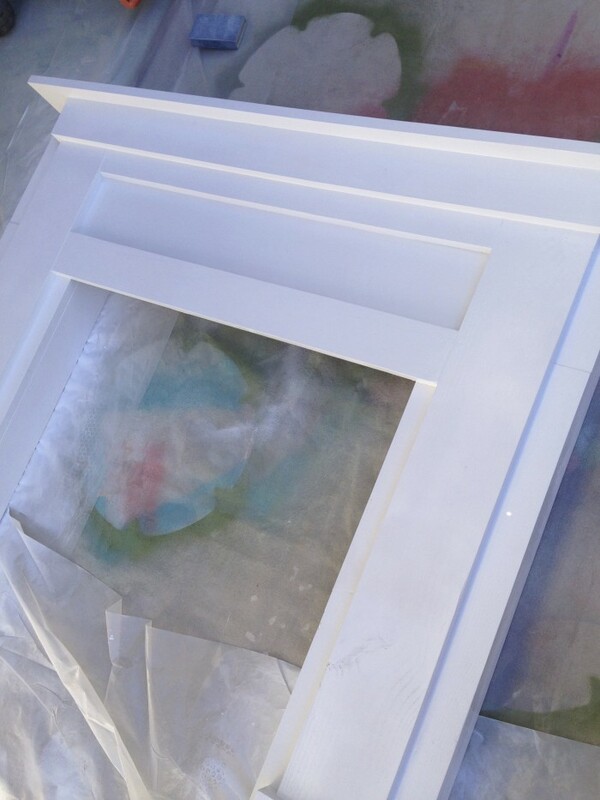 I took a piece of plywood cut to size for the backing…painted a few of the shims with a whitewash and attached them to the plywood using one of my favorite tools…my brad nailer. The edges were then trimmed off with a jigsaw. Once the firebox detail was complete, it was attached to the backside of the faux fireplace. The entire unit was secured to the wall using a small “L” bracket. and here is what is looks like most of the time. 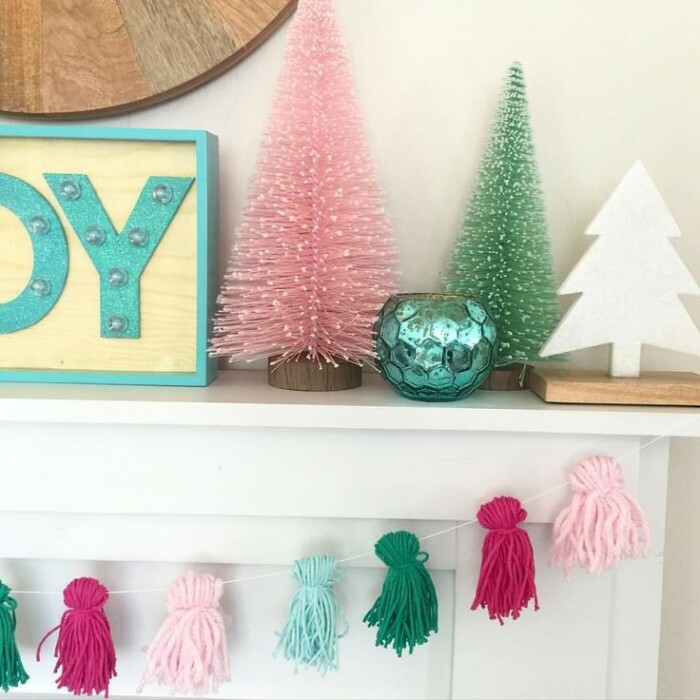 We will be sharing the full reveal of this years holiday fireplace and mantel decor soon…make sure to check back to see how we are changing it up!! Cheers!! Beautiful! Love the decor. Are you able to supply the supply list and exact plan that you used? Thanks! I love this and is exactly what I’m looking for! 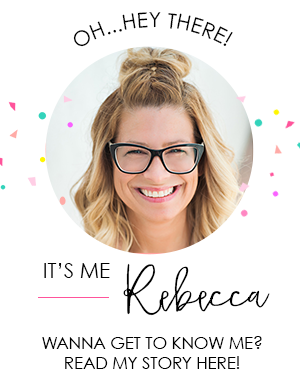 Would you be willing to share your plans with me? I love it so much but new to DIY projects! Thank you! Would LOVE the supply and cut list for this. Live in NYC apartment with a bit of wall space for which this would be PERFECT! It’s beautiful! I used plans and cut list from this link…I made some adjustment as I went to modify it for my style (: Hope this helps!! I have to ask where you got your shims because the ones from Home Depot aren’t nearly as nice. Did you secure it to the wall at all? I live in an apartment building, so I’d like to avoid drilling holes if I can. I can’t tell from the pictures if it’s secured at all. This is wonderful!!! I’m hoping to move out of dorm living and into an apartment in the next year or so. I absolutely want to build this but I know I won’t be able to attach it to the wall with nails. Do you think it would be stable enough on its own if it has a wide base? Thanks! 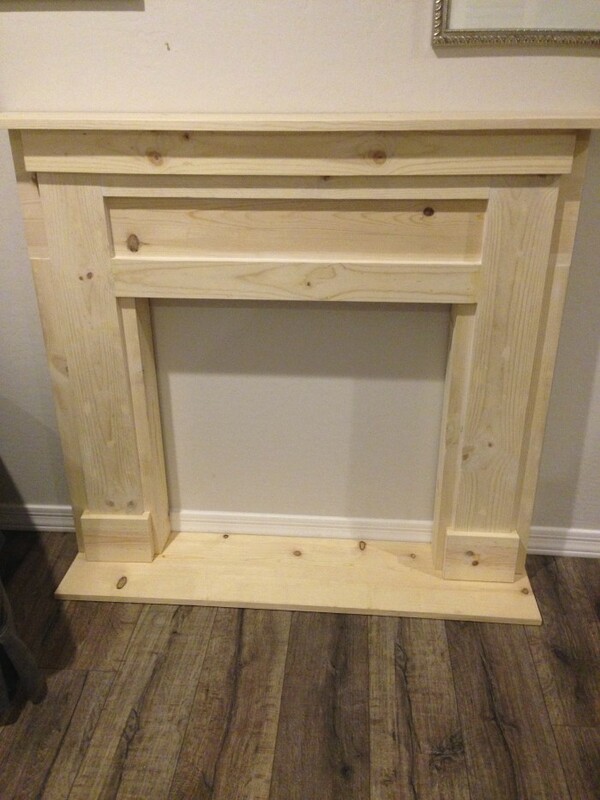 I have a handmade oak mantle, how would I attach it to dry wall? 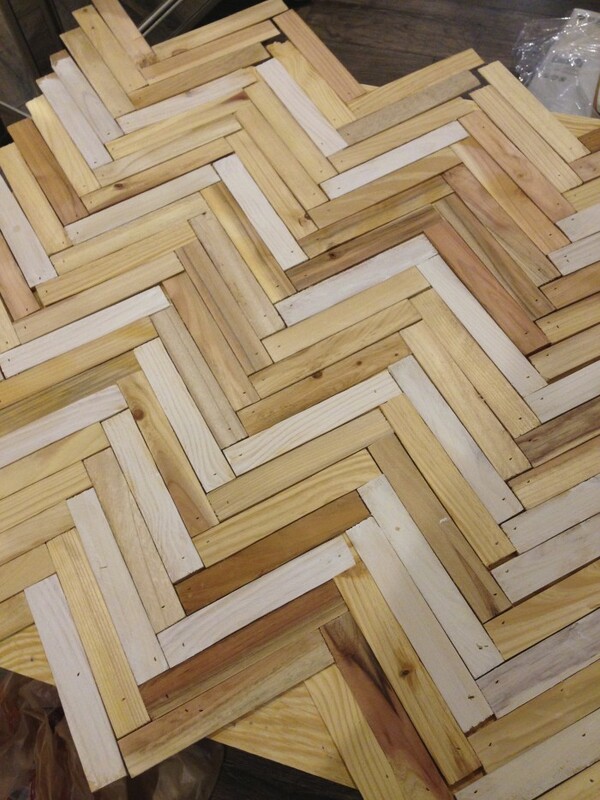 Love your design and workmanship! (Front of fireplace). Where did you purchase it? I absolutely LOVE!!! 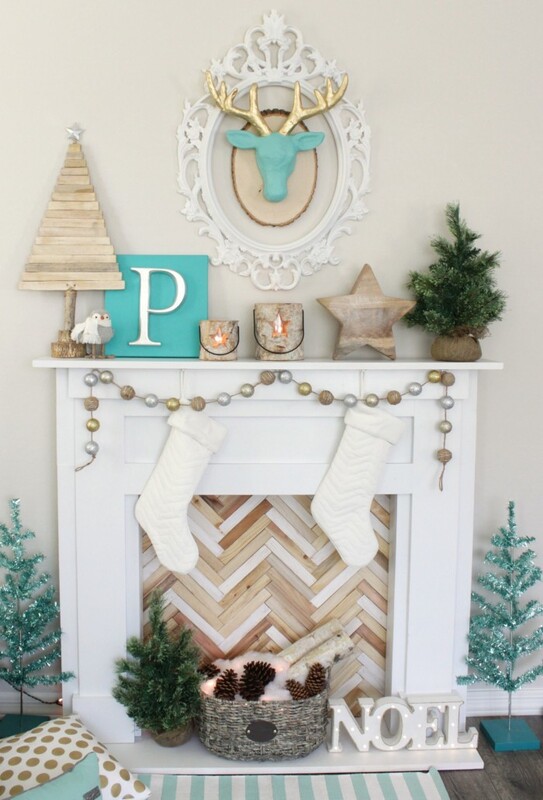 I just completed a faux fireplace myself. 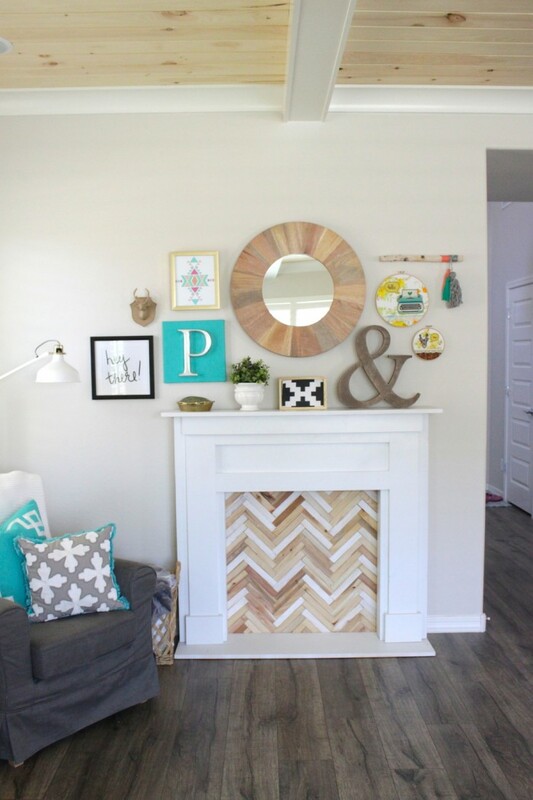 I was lucky & was ablevto purchase an exsisting faux mantel. How much would you say start to finish with your materials? 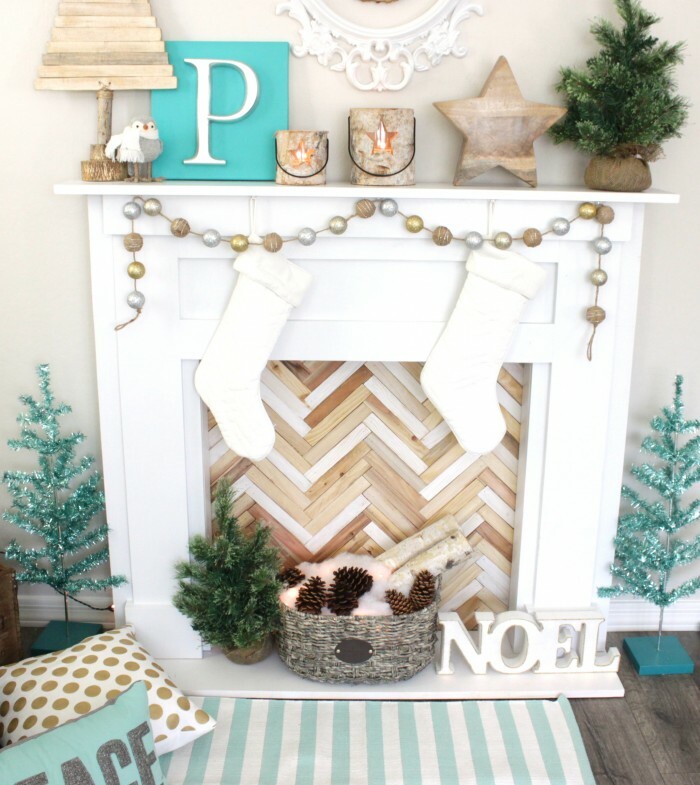 I have a few friends wanting me to design them their own mantels….but not sure on the price range? Very nice and thank you for the clear directions. I’m going to do this for my home office and slide in one of those free-standing electric heaters that look like cast iron stoves. 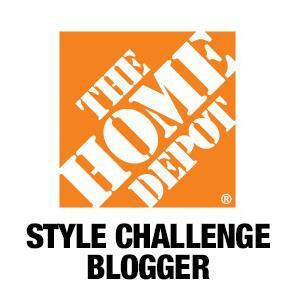 This is such a great idea, and it looks great!